What springs to mind when you imagine your hen do in Barcelona? In addition to amazing nightlife, beautiful scenery and delicious drinks, you probably think of dining on incredible tapas too. Well, this tapas meal has it all! 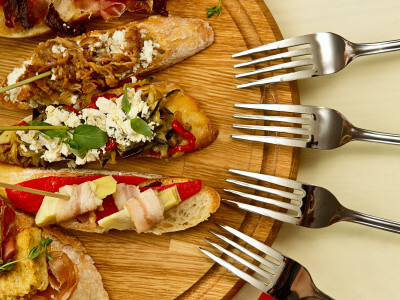 Your group will dine on a delicious “surtido de tapas” at a restaurant right in the centre of Barcelona. “Surtido” is Spanish for assortment, meaning you’ll get to sample a massive variety of the best tapas that Barcelona has to offer, accompanied by sangria. After this perfect warm-up session of 2 hours at the restaurant, your group can head wherever the night takes you!